1785 (Jun. 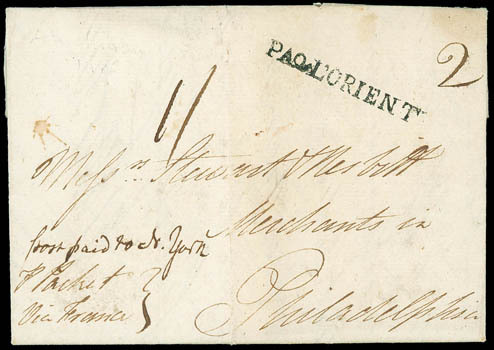 9) Amsterdam, Holland to Philadelphia Pa. via French Packet, datelined folded letter endorsed "P. Packet Via France" at lower left, bold "PAQ L'ORIENT" straightline handstamp and additional "post paid to N. York", carried via the French packet 4th Courier de New York that sailed from L'Orient Sep. 30th to New York arriving Nov. 13th, entered the post with New York manuscript "2" rating, Philadelphia manuscript "1/-" local currency rating., clean and Very Fine, ex-Siskin. Letter was sent prepaid to New York where rated the single 2 dwt rate for 60-100 miles to Philadelphia, where rated 1 shilling in local currency (10d postage plus 2d carrier fee). 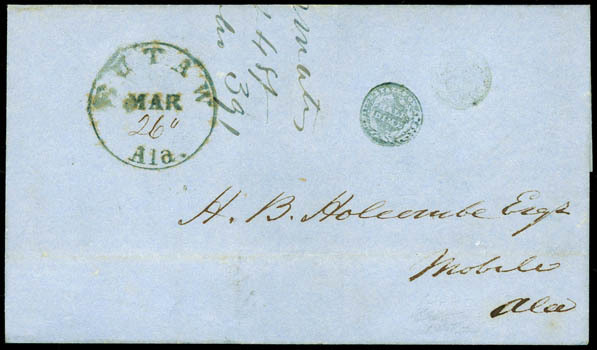 1842 Folded Cover from Fairfield, Iowa, Dec 27, to New York City, postmarked clear strike of yellow territorial circular date stamp with manuscript "25" rate, Very Fine, a very rare color postmark from Iowa territory; with 2011 P.F. certificate. 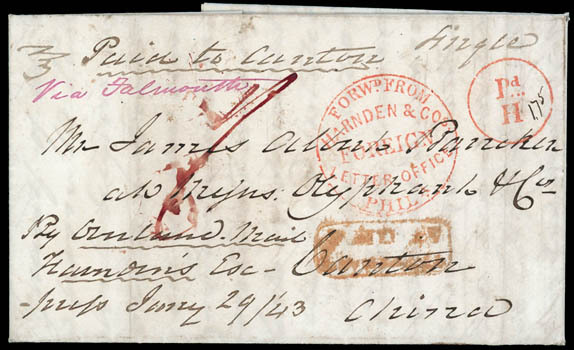 1843 (Jan. 29) Philadelphia Pa. to Canton, China, datelined folded letter with red "Forwd. 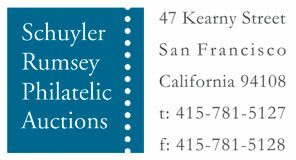 From Harnden & Cos. Foreign Letter Office, Phila." circular handstamp and matching "Pd… H" circular handstamp with ms. "1.75" notation within, endorsed "Single" and "Paid to Canton" at top and "By Overland Mail, Harnden's Express Jany 29/'43" at bottom left, additional red manuscript "Via Falmouth" at top left, reverse with neat strike of "Forwarded Through Willmer & Smith's, British & American Package Express Office, Liverpool" oval handstamp, entered mails partial red Liverpool (1.27) transit backstamp and matching "Paid At / Liverpool" framed handstamp on face with red manuscript "1/-" shilling prepaid rating, Very Fine and choice. AN EXCEPTIONALLY RARE HARNDEN'S EXPRESS PHILADELPHIA USE TO CANTON, CHINA. As an indication of rarity, a perusal of recent auctions did not turn up another Harnden's use from Philadelphia to China. The sender prepaid $1.75 for transmission to Canton as indicated by the Paid Harnden's marking. 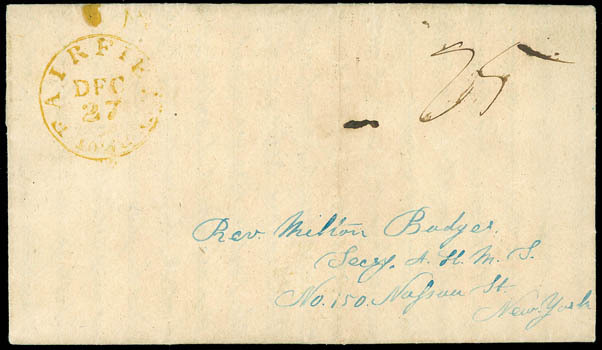 1848 Folded Lettersheet from Eutaw, Ala., to Mobile, Ala., full strike of cds with manuscript date on 1., with exceptional strike of fancy Half Dime Coin rate handstamp, Extremely Fine; with 2009 P.F. certificate. A WONDERFUL EXAMPLE OF THE EUTAW ALABAMA FANCY HALF DIME COIN RATE MARKING. Eutaw, Alabama is known for various fancy postmarks, including several other coin rate handstamps and the later fancy Postmaster's name "J. Chiles" in ribbon entwined around ornate patriotic shield. 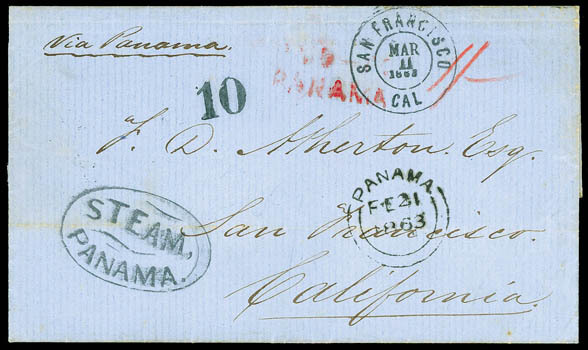 1863 (Feb. 2) Concepcion, Chile to San Francisco, Cal., blue 1863 folded letter with partial British Valparaiso (2.2) backstamp and red manuscript "1/-" rating, Panama (2.23) transit datestamp and red "Paid-To / Panama" two-line handstamp, entered U.S. mails with "Steam Panama" type 1 oval handstamp, matching "San Francisco, Cal, Mar 11, 1863" cds (Williams SAF-600) and bold "10" rating, fresh and Extremely Fine, ex-Patrick Campbell. A CHOICE "STEAM PANAMA" USE FROM CHILE TO SAN FRANCISCO CAL.